Been ignoring my suggestion for years then? Good list, definitely will have to trek through it. Great list. Derek Bailey is... strange. I won't knock him quite yet, though. Saw this list a little while back and I have heard 15/130. I'd personally recommend the Blind Willie Johnson, Pearls Before Swine, Eric Dolphy, Faust, Skip Spence, Alvin Lucier, Comus, Iggy Pop, Chrome and Family Fodder. Bad Brains have always been overrated in my opinion, don't see the appeal. I've listened to the Pere Ubu, John Cale, Human League,and Bob Dylan records featured here, and that is it. My music nerdery is showing it's limits it would appear. I really love Skip Spence's Oar - it really is one of my favorite albums. Also, really pleased to see Blue Cheer's Vincebus Eruptum on there. Very solid album, that. I'd actually almost forgotten about the Bad Brains before reading the list - haven't listened to them in ages, and that album is wonderful. Also - loads of stuff I really need to check out on there. Did you recommend that to me at some point? I'm amazed how much I forget sometimes. I got this based on the write up in that list and, damn, am I impressed. I don't think I've ever heard music that sounds as incredibly alien as this does. 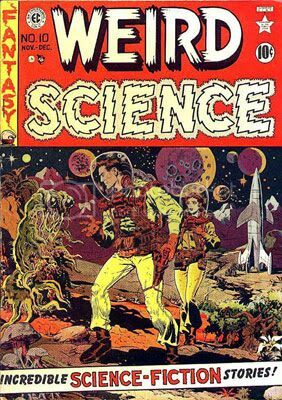 When I listen to this for some reason all I can imagine is that I'm an astronaut in some 1950s science fiction comic like the one below. I stumble into one of the towns those weird, green, blobby aliens live in and discover an orchestra playing in a purple cave. The music they are playing sounds exactly like this album.